After you watch the video series, please share your feedback by writing info@thesecrettowriting.com. Who should watch the video series? Running Time: 10 Episodes, 2hrs. and 7 minutes. The How to Study Class video series is a comprehensive guide that provides practical tools for academic success. It touches on the foundational skills needed to ensure personal and academic goals are achieved. 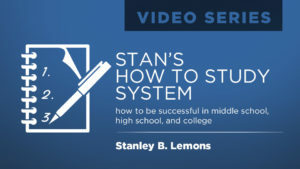 I like the fact that Stan encourages parents and students to begin the process as early as middle school. We used nuggets from The How to Study series in our Life Skills workshop with adult learners preparing for their GED. The program is easy to follow, incorporating useful tools, such as setting goals, being organized, managing time, effective communication, note taking and more…all designed to establish winning habits. Several students commented that they wish they had been introduced to these methods when they were in school.